~ You just need to be faster than someone else. A good run around Thaddeus Kosciusko Park in Dublin. I really like this park as it has a gentle slope and has a mix of gravel path and the ability to head off into the woods. As usual I did a clockwise loop on the gravel path for 1/2 mile and then headed across the field and into the woods for a slosh through the mud. 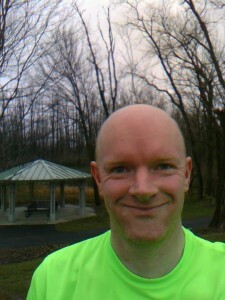 Yet again the weather was great for December, I was wearing shorts and my Columbus Running Company bright green shirt. The ground through the woods was pretty muddy due to the rain we’ve had this week but still firm enough that I wasn’t going to slide all the way down the hill. I got to the pond, looped around and headed back to the main trail and completed the 2 mile loop on gravel. It’s nice to see that the gravel path seems to be holding up and is a nice offroad 1 mile loop (the woods adds another mile to the loop). I finished the first loop and as I’m still slowly increasing mileage, I headed back out on the loop and took a diversion off one of the paths intending to cut through the middle of the loop and cut it in half. Instead the path I chose for some reason dropped down into a valley, over a stream and back up the other side and then back to the path I had left. I therefore decided just to run back the way I had came but made a mental note that next time I’ll use that side path as it gives you more of a workout (not a big one mind) going down the hill and back up again than staying on the gentle incline. I did regress to my childhood as I splashed through some of the puddles and sure enough my socks were a very dark brown when I took my shoes off but I did get an impressive set of splashes up the legs. After the run I tried to take a picture of myself with the shelter in the background and the bright green Columbus Running Company shirt I was wearing. Unfortunately the fact that I didn’t get to sleep until 3am this morning and then up at 7am – makes me have a weird fixed eye gaze in this photo – but you can see the brightness of the shirt. So after the photo was taken I headed off to Kroger for some weekend shopping and whilst I was walking around the aisles I had a funny experience. I was looking for some enchilada flavoured soup that I’d had a couple of days ago, had my running shorts and the bright shirt on and was looking puzzled in the aisle as I could not find this soup anywhere. This woman came up to me, tried to squeeze by me and so I moved the cart over and she said she liked the shirt – it was nice and bright. Seeing as though I’m in my running shorts, shoes and a running shirt, I assumed she knew I was a runner, laughed and said that it was so I don’t get shot as it’s hunting season. She looked at me blankly as if to say “why would someone shoot at you in Kroger?”. I explained that you have to take precautions when running through the woods. Yet again I got a blank “there are no woods in kroger”. I explained, Not *here* – I was running in the woods earlier and the shirt makes me more visible. At that point – the penny dropped for her – she hadn’t realised I was a runner and was just liking the brightness of the shirt I was wearing (or trying to make conversation). *At Least For Runners – isn’t it perfectly normal behaviour to wear bright clothes so they don’t get shot and go to Krogers? 1. What is the weirdest conversation you’ve had in the grocery store and do you go shopping in your work out clothes or go home and change first? I don’t mind shopping in my work out gear but if I’m wet from rain or a sweaty run, I do avoid the freezer aisle as wet clothes are not pleasant and in the case of sweat I do towel off and use deodrant first. 2. What other Perfectly Normal Behaviours are applicable to runners? I’d have to say running in the road rather than on the footpath. Used to bug me as a nonrunner to see runners doing that, but I know the tarmac surface is a lot kinder than the footpath – less tripping hazards to start with. However the camber of the road and crazy drivers does offset this benefit. Give me a trail through the woods any day. Finally, I wholeheartedly agree about running on the street vs the footpath (I’m assuming this means sidewalk? :o) Way too many chances for me to trip over my own feet. The street does pose some obstacles as you mentioned, since I was almost run over by a white SUV the other night. Hello, can you not see my multiple reflective surfaces AND my alien like headlamp??? If the Holiday Running Challenge doesn’t kill me, the crazy drivers will! It was a good run the mud wasn’t too bad – just a few big puddles to avoid but enough to give the BA feeling 🙂 . Wading through mud only sounds fun when doing something like a tough mudder or warrior dash race. This is a pretty nice route as half of it’s on gravel and the other half through the trees. There are some other trails in the woods so I’m going to have to try another route out there at some point as I increase the distance. I must admit that I was looking for soup from a can, but that is because I didn’t know they did fresh soup like that – at least I hope they don’t just reheat the canned soup up and pretend it’s homemade. Ever had whole foods soup? I’d imagine theirs is even better than Krogers soup. I think sporty spice is a compliment – were you wearing workout clothes *and* singing in the aisles? I could see that causing a comment like that. I was surprised to see them perform at the Olympics this year. Dublin is pretty good with their sidewalks but there are still too many opportunities to trip. I remember tripping in the Capcity Half and as I stumbled and ran fast to catch my balance I think I reached my fastest point on the race. Was so glad that I didn’t fall over as having to run another 9 miles would not have been fun on a grazed knee. 3. Assuming you all like soup for keeping you warm, what soup is your favourite/what do you recommend and have you ever had soup after a race? I totally go shopping in my work out clothes right after the gym. Typically, my clothes are also annoyingly hot colors :). Lol I remember your comments about shopping after the gym. Having hot colors isn’t too bad – it obviously makes you stand out in the crowd which is great is you’re ready for those funky conversations about getting shot at in Kroger. Most of my gym stuff is dark but I do have a couple of very bright dayglo shirts but they’re both long sleeves so tend to be for outdoor running. OH! I think this is the first pic I’ve seen of you. I totally already read this post. I’m surprised there’s no comment!! I could’ve swore I had. Anyway, gym clothes are fine to wear anywhere. FACT. Thanks Ali – I have a few facebook photos from races (on my personal facebook page) and training that I guess I should put up here. I don’t normally have this kind of stare, but not taking that many self portraits (as you mentioned from the lack of them), I felt more and more self conscious – especially as that was attempt 3 I think. Its *really* great to be running again now – 3.5 miles is this weeks long distance although the weather forecast for tomorrow is cold. First 2013 race(s) is now paid for. Andy on Underarm crutches are painful and a new gadget – Bone Stimulator. Snehal on Underarm crutches are painful and a new gadget – Bone Stimulator. Andy on 4 mile run!